Children under the age of 17 currently represent 23% of Forsyth County’s population and are projected to represent approximately the same percentage of the population by 2030. As previously discussed, childhood obesity is recognized as a major health issue in Forsyth County. More than one-third of children and youth are overweight and 17% are obese. 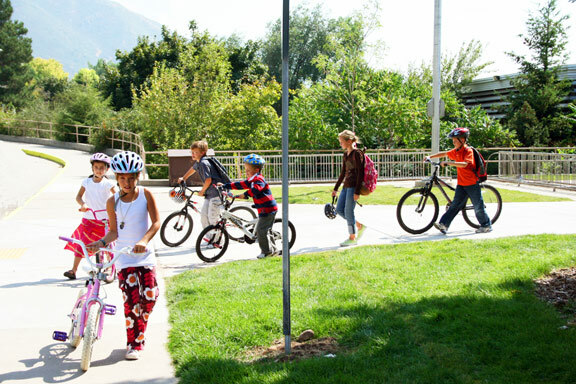 Children need to be provided with the opportunity to walk or bike to school and other neighborhood destinations, play safely outdoors, live in a healthy environment, have access to healthy food and interact with their peers and elders. The auto-dependent character of most suburban developments has negative impacts on the health, well-being and development of children. The percentage of students who walk or bike to school has declined precipitously over the past three decades from 44% in 1969 to 13% in 2009. Children with few neighborhood amenities or lacking access to sidewalks, parks, playgrounds or recreation centers have 20-40% higher odds becoming obese or overweight. Winston-Salem and Forsyth County have undertaken some initiatives to improve children’s physical activity and make the community more child-friendly including Winston-Salem/Forsyth County’s Safe Routes to School Pilot Program projects, sidewalk construction, the placement of bike racks in the vicinity of schools, parks and recreation facilities, and the establishment of school gardens/community gardens to promote healthy eating and physical activity. The Behealthy School Kids program is now in 17 elementary schools. The program supports healthier lifestyle choices through individual change and environmental policies.